At our core we are a laboratory dedicated to making better tasting spirits. In the process we develop novel flavours and new twists on old standards. The Sweet Serenitatis series is our take on traditional Liqueurs. We only use real flavouring and we add no colouring. The colour of these liqueurs is derived entirely from the botanicals we use to derive flavour. To make these, we cold steep botanicals in concentrated alcohol to preserve the fresh and complex flavour of the original plant. We then add simple syrup (never corn syrup or artificial sweeteners) and dilute the mix to 20% ABV. All the of Sweet Serenitatis crème's are vodka based and infused with their appropriate flavours at low temperature to preserve the fresh flavour. All the of Sweet Serenitatis are vodka based and infused with their appropriate flavours at low temperature to preserve the fresh flavour. This is the Gin you will reach for when you are making a classic cocktail like a martini or a gin and tonic. Our London Dry Gin has been described as spectacularly normal and ordinary taken to the extreme. We balanced the mix of botanicals as a dyed in the wool English gin. What makes our gin extraordinary is the level of care we take in every aspect of production. Our base spirit is smooth enough and clean enough to be sipped straight at room temperature. We distill this again and add a simple but extremely high quality mix of juniper, coriander, angelica, and licorice root. This gin is like a simple and classic tune, played by a master. This product is our unique take on gin. 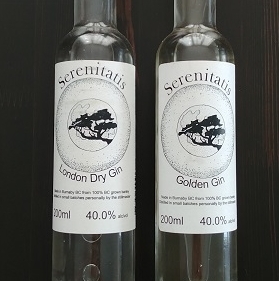 At its core is a traditional London Dry Gin. What makes our recipe unique is not some secret ingredient, it is the way we use them. We put a small part of the botanicals in the top of the condenser. Some of the hot vapour condenses on the botanicals and draws out the golden colour and a rich spectrum of flavours that cannot be found in other Gin recipes. Golden Gin starts as London Dry Gin, but goesw through a second stage that mutes the sharp medicinal notes and enhances its herbal character.